Well, it’s official. We are getting a collie puppy. His name will be Quinn, and he’s a smooth blue boy. He was born April 12, 2012. He’s adorable and I’m very excited to bring him home! I’m leaving tomorrow with a friend to head down to Albuquerque, New Mexico. There is a three day agility trial down there this weekend, which Jet and Tatum are entered in. Then on the way home we’ll be swinging up through Taos, New Mexico, to pick him up. I’m very excited, and very nervous. My days are gone where I’m stressed about having five dogs again… okay five is a lot, but having lost three collies in two years, all my smooth blues have left me, I’m feeling a very big loss in my heart and I miss them very much. So I found this wonderful breeder, Kayloma Collies, and off I go to pick up a puppy. Lucy and Levi, I didn’t start training them until they were about four years old. And they were my first attempt at performance dogs. Lucy didn’t really like working, so she was retired early. Levi loved it, and was my first agility dog, first obedience dog, and we did some herding too. Of course working with him formed one of those bonds that I’ll never be able to explain to anyone who hasn’t done performance with their dogs. He’s been gone for over three months now, and I still miss him terribly. So now Quinn will be the next generation of collies in our house. I hope I don’t cry too much when I meet him and the rest of the puppies. I’m sure I’ll adore him for his whole life. I’m nervous about all the training we have in store, but once he’s home, I’m sure it’ll all be fine. I am so pleased for you!! 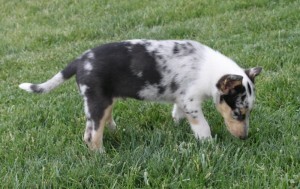 Kayloma has excellent performance collies, so you and Quinn will have a great future together. I looked into Kayloma too, but they have mostly smooths and I want a rough. They raw feed and no-vax, so that’s great too!! Good luck at the agility trial and with Quinn!! Thanks Dianne! Yes I prefer the smooths… I’m not as much into the grooming. 🙂 This litter actually has 4 roughs and only 3 smooths, we were hoping for more smoothies but you just never know! Thanks Jolene… it’s so hard to lose them. I guess I need to change Levi’s status here on my blog, but I still can’t bring myself to do it. super cute!! You’re going to have so much fun together! Good luck with your new puppy!! Kayloma has beautiful dogs and I really like her rearing practices. I had a Quinn, he’s in a pet home, but around 10 1/2 years now and behind my collies. Previous Previous post: How Much In Life Should Be Free?